The first thermostat built to listen and learn from your voice. The first thermostat built to listen and learn from your voice - interact with your thermostat using simple voice commands. Advanced 'far-field' voice-control technology that breaks through the ambient noise of a busy household and recognizes voice commands. Change the temperature of your home by just speaking commands to the thermostat. This unit features an E-prompt Chip with a small battery and real time clock that will save your settings even if power is lost to the thermostat. 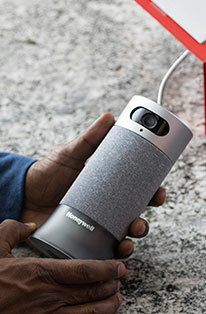 The revolutionary Voice Controlled Honeywell Wi-Fi Smart Thermostat is the first thermostat built to listen to your voice and learn new commands based on how you interact with the thermostat. Simply say, 'Hello, thermostat,' then use one of the pre-programmed commands like 'make it four degrees warmer', to tell the thermostat which action you'd like it to perform, and your thermostat will respond accordingly. After installation, the cloud-based, voice-controlled Thermostat will immediately recognize your voice and adjust settings accordingly. It will even get smarter over time, adding more commands based on its interactions with you. Honeywell's reliable and highly-rated app allows you to program your thermostat from your computer, tablet, and smartphone, whether you're across the room or around the world. 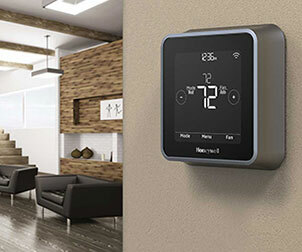 This Honeywell Wi-Fi thermostat offers several features including a customizable touchscreen, email alerts, weather forecasting, advanced fan control, flexible scheduling, simple setup, Wi-Fi remote access, and voice control. The Honeywell RTH9590WF thermostat makes controlling the temperature of your home or office easier than ever before. Save money while conserving energy in style with this smart voice controlled thermostat. C wire is required and is the power source. 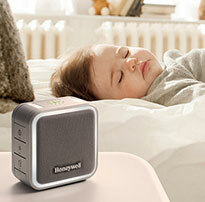 Without a C wire, the Honeywell Wi-Fi Smart Thermostat with Voice Control will not power up. Reviewed: 02/29/2016 by Nicholas P.
Easy installation just had to connect my unused c-wire which was already ran. Easy to set up, it took me 2m I believe. Can control from anywhere from any device with an internet connection. If I had to be picky, there's always room for improvement! I would ask for more colors for the background, I think there's 20+. Anyways, love this thermostat. 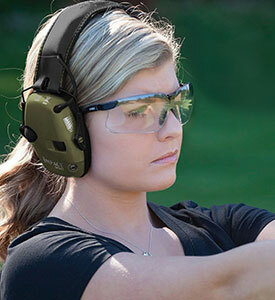 Very pleased with the functionality and ease of operation. Installation was a piece of cake, as long as you follow the instructions. Wish the voice had a little more personality. Awesome thermostat and great price. Had to install c wire which was very easy. The tech support person was extremely patient and helpful in describing what colors I had to match to my current 2 stage geothermal furnace thermostat. Panel is so easy to read you dont even need directions. It was just what I ordered. It was very easy to install, I had to connect the C wire to my furnace but other than that very easy to install and operate. Love it. Reviewed: 11/05/2015 by Michael S.
This is the thermostat that you want in your home! Installation was seamless and the voice commands are very user-friendly. Consumer Report had this model #1 on their list for wifi thermostats. I'll probably take it with me to my next house. It took some effort to get it properly set up, but it now works perfectly. I had it professionally installed and the basic functions worked fine. But after initiating wi-fi access I got a message to the effect that it was connected to the network but unable to connect to the internet. Internet access is required for voice control. My ISP internet service provider had to tweak some settings at their end to fix this problem. Then the device was unable to get info on outside temperature and humidity until a Honeywell phone tech led me through a few manipulations on mytotalconnectcomfort.com/portal. Now its fully operational and, as noted, I'm very pleased with it. Consumer Reports rated these at the top so I bought two. Had them professionally installed, which was good because one of them required an additional wire, that my HVAC person added. small detail, no problem .. The thermostats work great, have great displays, and are controllable from the web and my phone, as well as at the wall. The numbers are large and easy to read and the controls are very simple to navigate. I would recommend highly.